Every bra ordered comes iwth a free Deer Antler Pendant. 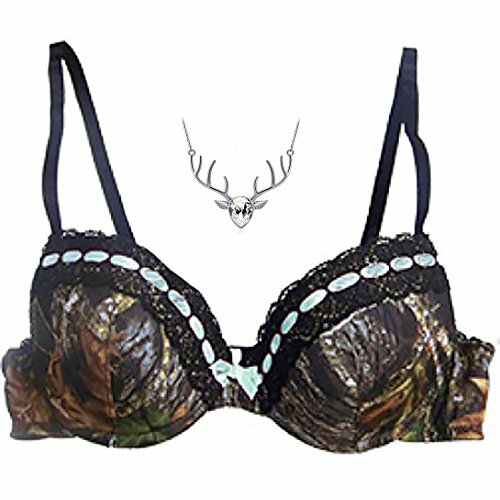 We don’t ensure any colour – it might range from navy, red, pink, transparent, gree and different colours) Lovely and supportive, this camouflage underwire bra options padding for added raise, Mossy Oak Break-Up® COUNTRY® camo imprinted on the bra, scalloped black lace and a marginally of aqua ribbon so as to add to the appeal. Scalloped black lace with an aqua ribbon woven all the way through outlines the highest of the cups Accented with an aqua bow between cups Underwire Black adjustable straps Two-hook back closure Ample strengthen and extra padding to create cleavage ninety two% polyester/8% spandex mix Machine wash cold on delicate cycle. Don’t tumble dry. Wilderness Dreams Branded Bra With Free Pendant.